With a 12 megapixel resolution, the Spypoint HD-12 surveillance camera has the most advanced technology among Spypoint models. It is equipped with 46 black flash infrared LEDs, invisible to the naked eye. Ideal for security use, the HD-12 ensures peerless discretion, even if the subject is close to the device. It supports video recording in high definition (720p) and captures ambient sound automatically when recording movie clips. View photos and listen videos directly on the spot using the 3.0" viewing screen and built-in speaker. The HD-12 camera can be remotely triggered by a WRL-B device, included with the camera. The HD-12 camera comes with Spypoint WRL-B motion detector , which allows remote triggering of the camera. You can increase the surveillance zone by positioning the WRL-B device further away from your camera, while continuing to use the built-in motion sensor of the HD-12. Removable internal camera for easier handling. The HD video recording is from 10 to 90 sec. (720p). Multi-shot mode offers up to 6 pictures per detection. The camera can be powered by a rechargeable lithium battery pack (not included) and maintain it's charge by a solar panel. Date, time, moon phase and temperature stamp on pictures with instant trigger time in electricity mode. 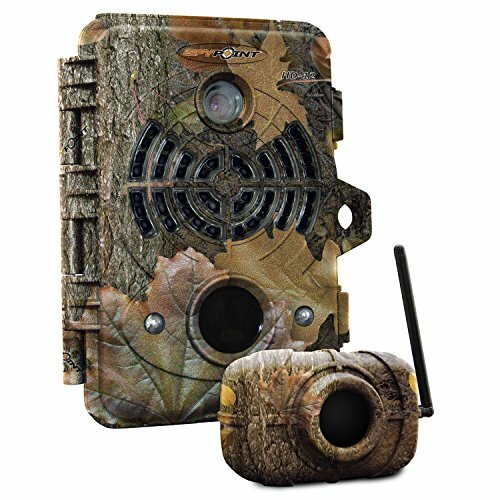 Additional features include, automatic infrared level adjustment, color pictures by day, black and white by night, adjustable period of operation, sound recording, built-in speaker, time-lapse mode, is very compact measuring 4.5" by 6.8" by 2.8", and adjustable distance detection sensor (5 to 50 ft). The kit includes HD-12 camera, WRL-B detector, straps, usb and video cables and users manual.